Say hello to the eDGe, the name that I cannot write without MS Word auto correcting the hell out of me. This is a device that gives convergence a whole new side. 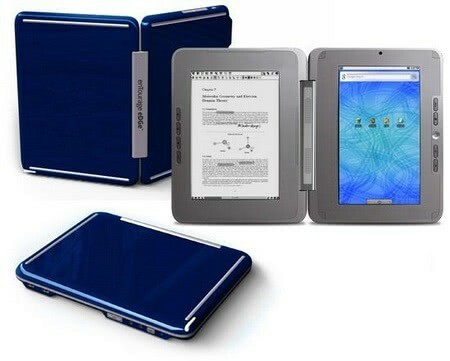 Entourage has taken specialty devices like an eBook Reader and netbook and put them both together to have a dual screen, multi-function device. Hence the name DualBook. Actually, I think this is a great idea. Consumers do not want multiple devices to carry and that is the main reason why convergent devices came in to existence. But even as newer devices are brought in to the market by the companies, we find ourselves owning multiple devices that we would love to carry with us. But we also want to travel light. So it’s usually a toss up between cramming the netbook, the eBook reader, the large smartphone and a PMP into your bags or carrying just your smartphone and maybe the netbook. However, you cannot use either a netbook or a smartphone under direct sunlight and the battery life is usually not conducive to hours of reading. So Entourage’s idea is to give you something that will let you read books and surf the net at the same time. 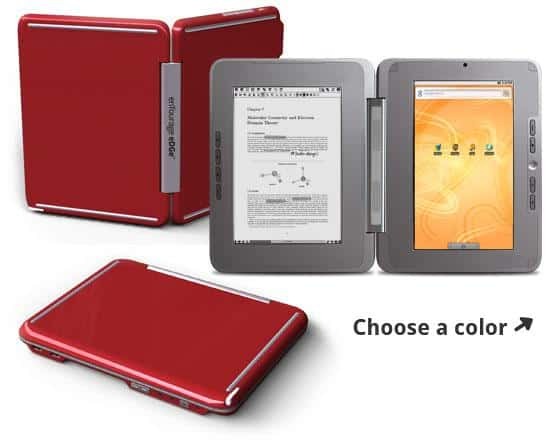 They give you an e-Ink using eReader screen that is 9.6” diagonal (1200x825 pixels) and has all the features of an eBook reader – like zooming, taking notes directly on the book, glare free screen and the ability to read under direct sunlight. Using its various connectivity options, which I am coming to in a bit, you can choose to store your notes and journals on a server, email them to a friend or just keep them on the device. The screen accepts stylus input, so you can open a new journal page and draw on the screen. Text can be input by hand or by Bluetooth keyboard. The e-paper is Wacom Penabled, which is how you are able to draw on it. It supports both ePub and PDF formats, so you are pretty much covered on that area. What is does not have is an attached online store like the new Barnes & Noble’s Nook or the Amazon Kindle. But I do not see that as a deal breaker. There are enough ways to get Books these days. The netbook side is pretty basic. It has a 10.1” color touchscreen that displays 1024x600 pixels. The two screens are connected with each other and you can view the images on your ebook in full color on the netbook screen. It has a webcam and microphone that allow you capture video, still images and audio respectively. You have the option of hooking a microphone up to it if you want better quality audio recording . It as built in speakers as well. It supports Mp3, MP4 and 3GP file formats. You can browse the Internet, check and write emails, playback audio and video and type out long documents via Bluetooth keyboard if you so wish. It has an on-screen keyboard that you can use while chatting. By the way, this is an Android device. No wonder they can claim so many things about the software. Coming to connectivity, it has a lot of options for you. It has Bluetooth, 3G, WiFi b/g (no ‘n’) along with optional EVDO or HSDPA mobile modem. You can have only one type of modem. Battery life is decent for such a device – 16 hours for the ebook reader only and 6 hours for the LCD screen only. I am suspecting about 8-9 hours with heavy netbook usage from time to time and long hours of ebook reading. The inbuilt memory is 4GB, with 3GB available to the user, but you can take it up to 32GB with the included SD card slot. There are USB 2.0 ports as well. It will start shipping from February 2010 and is priced at $490. One thing that I do not get is why they charge $40 extra for getting it in a color other than the ‘midnight blue’. I can’t decide if this device awesome or terrible. They did stuck plenty of functions in it and kept price rational. On other hand I have trouble with idea of 1.1kg 25x20cm book, this hardly seem comfortable comparing to regular eink devices. Your english is terrible – try more reading! Replies like that left by Corker are unnecessary and part of the reason people from other nations think of Americans as crude and overbearing! Enough. I had the same reaction to the announcement of the device. At first blush, the device looks to be everything one could ask for in a single unit; however, it really is NOT a single unit. It seems heavy, battery life minimal even when using the e-ink screen alone… and, in fact, being two devices at the price of a good palm-top computer, you get an e-book reader as well. I guess we will have to wait and see. I’m the guy who want the separate devices. I don’t like the idea to have all on my phone. Don’t see need in such hybrid: if I use actively only half, I carry the other half anyway, – so what’s the point? Price is not bad, but only two formats are supported – what is definitely not enough for me. I’m assuming that when viewing a PDF file, if it contains hyperlinks you can click and visit them on the color screen. If that’s what it does and if it formats 8×11 PDFs well…I think that may make me a customer. I read (or want to read a lot of PDF files and visit the links they often contain, but not many e-readers can link out (in color) to view the linked content. Headphone jack is good, too. Device may need a podcast/vidcast tool….oh wait, I forgot, you can surf the web so google reader becomes available! Hmmm. Am I missing something or is this thing going to make bedtime reading, train rides, boring meetings better and more fun! It’s funny no one has mentioned the price of the ebooks on Entourage ebook store. Twice as much as Amazon! !